Further to picture #2115, another expedition to the site of the old gasworks at Ashfold has yielded a closer view of the two openings in the retort house as above. Closer examination of the two holes revealed that there is no soot in the interior. They are 18" x 18" deep with a 5" width chimney across the rear of both. The cavities are in the interior of the end wall of a building, of which there is no trace making it difficult to estimate its size. Without knowing how the exact working and the purpose of the holes and how they are linked to the hole on the exterior wall which must have piped the gas out to the gasometer, I am at a loss to understand how it all works. Is there someone out there who can explain the workings? 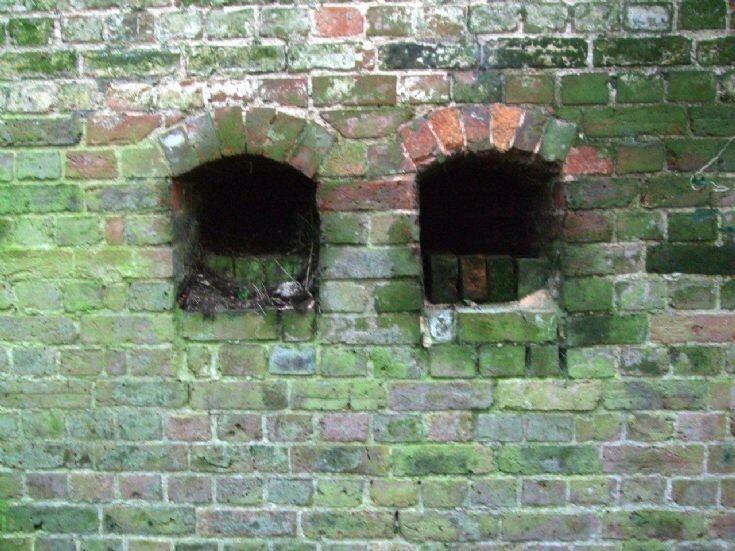 The size of the holes alone would indicate that they were not used to burn the coal, ie. furnaces. The Large Version shows the inside of a duct which is very chimney-like, but has no soot! Select Open Document to view the brick rim around the base of the gasometer. Beyond is the retort house with an exterior opening probably from which there was a pipe to transfer the gas to the gasometer. In the foreground is an old bucket pulled from the sludge which appears to have replaced the pond. Linda Knight’s 94-year-old father, Peter Brown, recalls that as a young lad living on the estate the gasometer base was a round pond of green water with a simple fence with poles and wire enclosing it. He remembers moorhens on the pond and that there was a constant strong smell of gas. He also mentions that the green pond was still there during WWII as he often walked down that way.